There are many roads that can lead to success. Leadership is about knowing the right road for the right situation. It takes skilled judgment to apply the right method at the right time, under the right circumstances. 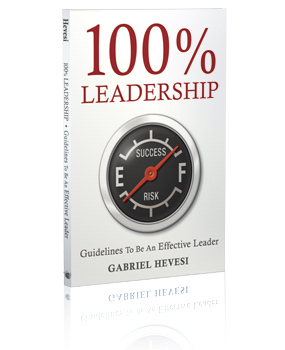 100% Leadership is a practical guide to daily decisions and actions. This book is written by Gabriel Hevesi a retired management consultant from Brazil with more that 50 years of front-line business experience. He shares valuable guidance on communicating, team-building, planning, and efficiency. 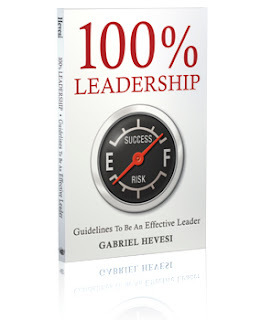 100% Leadership is an easy, quick ready at about 130 pages. The format allows for anyone from first time frontline leaders to seasoned executives to be able to read this book. Each chapter starts with a quote from a famous leader and ends with a checklist to support your thinking of the topic. The emphasis of this book is on usefulness. The book presents often opposing systems, theories, and opinions to provoke – to force your thinking to fit variables together like pieces in a jigsaw puzzle. The true test of leadership is how you use your judgment and common sense for selection, timing, and application of ideas. I enjoyed this book and found it quite valuable. As the subtitle indicates this is a helpful reference for anyone developing leaders in your organization. Both those mentoring and being mentored will benefit from 100% Leadership. Note: A copy of this book was supplied by the publisher Enna for review.